If you’re looking for a powerful commercial grade juicer that will make you fresh juice from fruits and vegetables within minutes, we recommend that you take a look at the Breville 800JEXL Juice Fountain Elite 1000-Watt Juice Extractor. The Breville 800JEXL is a centrifugal juicer with 2 speed controls – 6500 RPM (low) and 13,000 RPM (high) which allows you to control the ingredients you are using. Juicing fruits such as apples and carrots will be a breeze at higher speeds whereas you can easily juice fresh spinach, cabbage and other leafy vegetables at lower speeds. – The Breville 800JEXL features a circular three inch tube that accommodates whole fruits and vegetables without requiring them to be chopped down. You can feed whole apples, carrots and tomatoes into the juicer without having to chop them down into small pieces saving you lots of time and effort in the process. 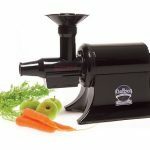 The feed chute is centered over the shredding disc which results in efficient juicing in comparison to juicers that have a chute towards the side of the shredding disc. 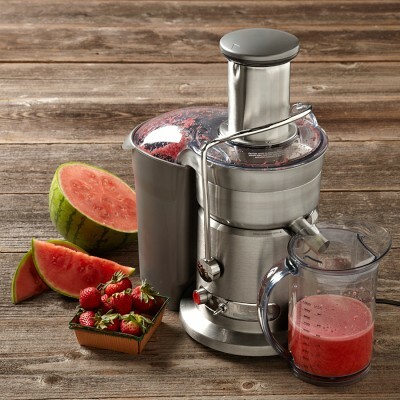 – The dual speed control system of the Breville 800JEXL Juice Fountain Elite allows you to adjust the speed of the juicer depending on the ingredients you are using. If you’re juicing softer textured ingredients, it’s best to begin on a low speed at 6500 RPM and then switch to high speed when you’re juicing harder textured ingredients. This ensures maximum extraction and the best results without any threats of oxidation or killing of enzymes allowing the juice to be stored for a longer duration. 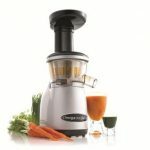 – The Breville 800JEXL juicer has an overload protection feature that prevents overheating and automatically shuts the machine down if it’s overloaded. This ensures that none of the parts break down due to overloading. – The Breville 800JEXL has been constructed in a manner to facilitate easy clean up. A majority of parts of this juicer except for the mesh filter and NutriDisc can be washed on a dishwasher. A cleaning brush is also included to clean parts that cannot be cleaned in the dishwasher. – One of the main problems with centrifugal juicers is that they tend to kill of enzymes due to excessive transfer of heat. The Breville 800JEXL makes use of NutriDisc and a patented juicing system to ensure maximum extraction of nutrients and transfer less than 1.8F of heat to protect the enzymes. – Faster juicing. The Breville 800JEXL being a centrifugal juicer makes juice faster than most other masticating juicers in the market which take longer. What took five minutes with a masticating juicer will only take a minute with the Breville 800JEXL. The Breville 800JEXL is designed to save you time and effort. – Breville offers a limited warranty on the motor and the parts (1-3 years). This is quite less in comparison to other juicers in the category whose warranty ranges from 10 – 15 years. This can certainly raise a question for a lot of folks about the longevity of the juicer. 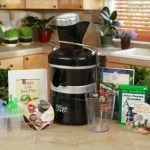 – The Breville 800JEXL being a centrifugal juicer isn’t designed for juicing grasses and leafy greens. While you can expect the Breville to do an excellent job when it comes to fruits and vegetables, you’ll find juicing grasses and leafy greens a bit annoying with the Breville. This is the case with all centrifugal juicers. If you’re looking for a juicer that can juice grass and leafy greens efficiently, we recommend a masticating type juicer. If you’re someone who’s looking for a juicer that can efficiently juice fruits and vegetables (including the hard ones) without having to chop any of them down, we strongly suggest that you go ahead with the Breville 800JEXL Juice Fountain Elite. 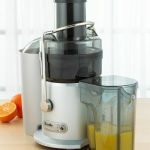 After reading this Breville 800JEXL Juice Fountain Elite Review you will realize that if you’re looking for a juicer to juice leafy greens and grass, this isn’t the juicer for you.